ParlophoneFollowing the announcement of the David Bowie vinyl singles box set Spying Through a Keyhole, which is due out on April 5, comes word that another upcoming vinyl collection featuring rare recordings by the late rock legend will be issued soon. 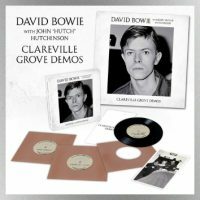 The Clareville Grove Demos box set features three seven-inch vinyl discs boasting six songs that Bowie recorded as a duo with John “Hutch” Hutchinson in early 1969. The home demos, four of which are previously unreleased, were recorded live to tape at David’s apartment in the Clareville Grove section of London. The two previously issued tracks are versions of “Space Oddity” and “An Occasional Dream” that first appeared on the two-CD 40th anniversary reissue of Bowie’s 1969 self-titled album. The other demos are “Lover to the Dawn,” a song that morphed into the David Bowie track “Cygnet Committee”; “Ching-a-Ling,” a tune Bowie also recorded in 1968 with his trio Turquoise; “Let Me Sleep Beside You,” a studio version of which was recorded in 1967; and “Life Is a Circus,” a cover of an obscure song by U.K. singer/songwriter Roger Bunn. The box set comes packaged with a print of a 1969 photo of David and Hutch at the Clareville Grove apartment taken by Bowie’s manager at that time, Ken Pitt, who also snapped the pic of David that’s featured on the cover. As with the Spying Through a Keyhole collection, all of the tracks in the Clareville Grove Demos box set are in mono and play at 45 r.p.m.